Let me begin by apologizing for the shortened week of posts. Some of you might have noticed that there was no post on Thursday, this was due to a variety of factors and I am hopeful that it will not happen again. Going forward I want to encourage you to “FOLLOW” the blog and to actively participate by commenting. Sam and I love to hear feedback. We have made a lot of progress and have exceeded the number of readers we were expecting so thank you all for reading and sharing the blog with your friends. The Formula: Read, Comment, Follow, Share, And Repeat. Today, while sitting at lunch a friend of mine told me about a great sports topic that Sam and I haven’t yet discussed. So you all know, this is her idea not mine. The wave of new uniforms across the college football landscape makes for an exciting topic to write about. In recent seasons the wave of new uniform designs from Adidas, Nike, and Under Armour has expanded in college football. Teams are making a name for themselves with helmet, jersey, pants, and equipment options that provide the fans something new to see each week. 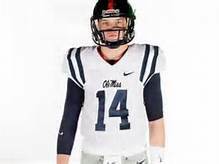 The reaction to many of these uniform designs is mixed and depends upon your personal preferences. 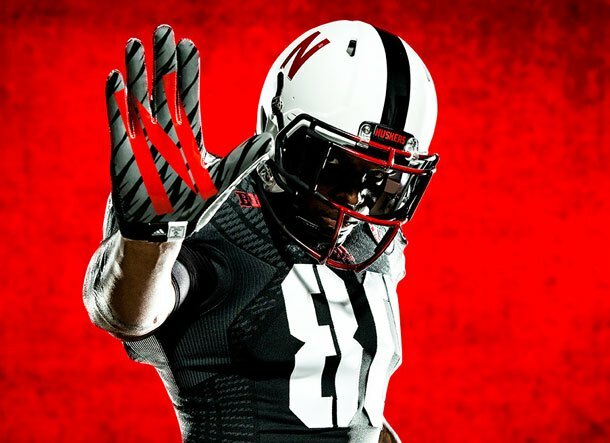 I know many people who are against the new looks worn by teams with “traditional” uniforms like Nebraska, Ole Miss, Georgia, etc. In some cases these programs are traditional powers and fans see the new uniforms as a “gimmick.” The very use of this word will probably tell you that the person you are speaking to also believed that the Internet was just a fad. 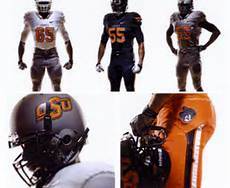 The bottom line here is that the new uniforms can be a vital recruiting tool and revitalize a programs image. 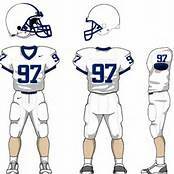 The Penn State football team has some of the most “traditional” uniforms in college football. They look like a high school team with a limited budget and no creativity. The program does have a prideful and successful past, but those days are long gone. In my opinion there is no team that could use the image makeover more than Penn State. They last won a title in 1986, which happens to be five years before I was born. What have they been doing for the roughly the last twenty-five years? The answer to that question is becoming a mediocre, BIG TEN team. They had the most egregious lawsuit in NCAA history filed against them. Penn State has seen it’s recruiting decimated by an unwillingness to change philosophy and tactics. Penn State football has become irrelevant on a national stage. Penn State also dabbled in generally disregarding strategic advancements in the game of football. The culmination of these factors results in spending a great deal of money for the same number of national title victories as the Akron Zips. Across the country, teams who have embraced the “cool factor” of the uniform craze have found success. 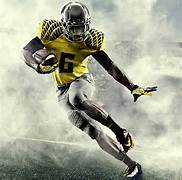 Oregon has made itself a national powerhouse with its spread offense and it’s stable of uniform combinations. The uniforms options create the “cool factor” and there is nothing that teenagers want to be more, than “cool.” If you look good, you feel good, and you play good. Pro: If I go to the game, I’ll get lots of pictures and be able to be a part of the action. I will be drenched in the applause of the crowd and the vastness of the multitudes of people who fill the stadium to its brim. There is no substitute for being there. Con: If I go to the game I will have to sit next to or around some people who will drive me crazy. This includes people who take their shoes off during the game. (This is not a joke, someone in the row behind me has done this) I will have to put up with a lot of things that I wouldn’t have to deal with at home. Pro: If I go to the game, I’ll get to see old friends and walk around the campus of my alma mater. Con: I will find out why I haven’t kept in touch more with some of those people. The campus is under construction and I might step on a nail. Pro: If I go to the game, I might sit around other alumni of my school. We can cheer our team on together and start up a new friendship. That friendship could blossom into a business deal. I could become a millionaire and marry their daughter. Con: I might sit next to someone with a child who is of an unknown gender. That child might dress in a way that it is impossible to tell whether or not he is a he or she is a she. That child might try to start up a conversation with me and will most assuredly have a unisex name, i.e. Taylor. The awkwardness will be suffocating. All in all the decision to go to a game is a difficult one. The cost of attending a game and concessions is not cheap. It is important to remember that if you are going to the game you come in with an idea of what you are getting yourself into. If you have a young child, I’d recommend sitting with the oldest people you can find. These people will be far less likely to make radical statements concerning the current political landscape and it’s possible ties to the officiating crew. If you find yourself in a good section, remember that you will still listen to people ask ridiculous questions about why a coach won’t throw it deep over and over. You might hear the guy next to you use football clichés for the duration of the game. There will be a drunken person. That person will make sure that everyone around them is aware of their level of intoxication. If you are the road team and you dare to go to the game, there will be someone who taunts you. In the event that you are being taunted here is my advice. First, figure out if that person actually attended the university that your school is playing. Second, if they repeatedly invade your personal space it will be necessary to take action. Third, if action is necessary due to violations of personal space or physical contact to you or your friends/family then you need make a decision. Fourth, you now can either be a responsible adult and contact the stadium security or you can make passive aggressive comments to this person for the duration of the game. If your team is losing or likely to lose, the former is the better option. Tony Romo is a bargain. The player that weathered the blame for a 51-48 loss to the Denver Broncos is also the only reason the game was that close. Did anyone in the major media outlets blame the Dallas defense for surrendering over 50 points? Do we not think that might have had something to do with the Cowboys’ loss? I realize that I am fighting for a guy who has made bad decisions in some in opportune times. However, I can’t help but like the way that Romo has performed in his career. Do those numbers surprise you? If so it’s probably because you have believed every major media outlet that told you that Romo was an atrocious player late in games. However, there is no statistical data to support that. Romo is a value player who is constantly being devalued by the masses of people who don’t know what the facts actually are. Peyton Manning has a losing record in the playoffs and Lebron James was labeled as player would couldn’t close until the previous two years. 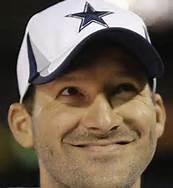 Romo has a great deal of ability and it’s unfortunate that the media has caused a great deal of public misperception. 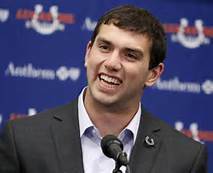 Andrew Luck is the best young quarterback in the NFL. It’s not Russell Wilson, Colin Kaepernick, Robert Griffin III, or Ryan Tannehill. Luck doesn’t get the same buzz as those guys because he is just plain dull. He lacks the flash of Griffin III. He also isn’t injury plagued and built more like a sprinter than a football player. He doesn’t do commercials like Colin Kaepernick. Luck knows that wings from McDonalds sounds like a big mistake. He doesn’t rely on his defense to bail him out like Wilson; his backup career isn’t being an unsuccessful minor league baseball player. Ryan Tannehill is best known for having the most attractive wife on HBO’s Hard Knocks during his rookie season with the Miami Dolphins. Luck won’t need a TV show to make his career relevant. Luck is not in the top 10 in NFL jersey sales. Unfortunately, being the best isn’t the same as being the coolest. Luck doesn’t have swag. Luck has results. Luck is goofy and has a neck beard. He is a football nerd. Luck’s football mind surpasses his physical tools. He has the size and measurable qualities that lead to NFL success but his path to greatness is determined by his mind more so than his tremendous physical ability.